Tilt and Turn handles can be found on tilt and slide patio doors as well as tilt and turn style windows. 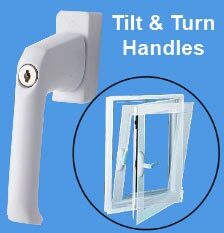 A tilt and turn window can open so it tilts in at the top of the window first and then in the second handle position will open the window inwards alittle like a door. This sort of window can usually be found on high rise flats so the window can be easily cleaned from inside. Uses: Tilt & Slide patio doors, Tilt & turn windows, Turn & Tilt windows.